In this unit you will learn two fretted notes on the first string and a variety of tempo indicators. ‘F’ is on the top line of the staff. To play ‘F’, fret the first fret on the first string. ‘G’ sits directly on top of the staff. 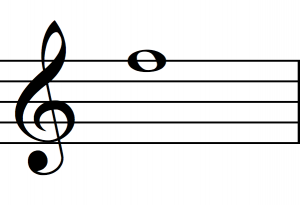 To play ‘G’, fret the third fret on the first string. Tempo is the speed, or pace, of a piece. It can be conveyed in two ways: in beats per minute (BPM) or with descriptive words. BPM is the most precise way to convey tempo. A rhythmic value is equated to a number that represents beats per minute. In the example, a quarter note equals 120 beats per minute, which means that the pace will unfold as two beats per second. To find an exact BPM, you can purchase a metronome or visit this free site: https://www.metronomeonline.com/. Prior to the invention of the metronome, composers used descriptive words to indicate tempo. 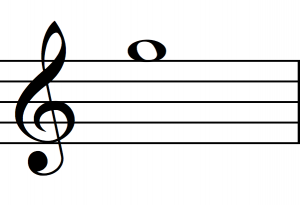 Many composers continue to employ these words along with or instead of metronome markings. Below is a list of ten commonly used tempo indicators. Italian words are traditionally used. You will probably encounter other words (in Italian, French, German and other languages) that are not listed here. Most of the time, the definition can be found with an online search. If you drop the rhythm—meaning you lose your place while sight-reading—I suggest you play only the first beat of each measure. This will allow you to mentally keep your place in the rhythmic scheme. When that becomes manageable, play only the first and third beats of examples in 4/4 time. Finally, when that becomes manageable, play the entire exercise. Theodore Norman advocated this method and many guitarists have used it to become great sight-readers. However, this is but one creative solution to a sight-reading obstacle. All great sight-reading guitarists engage in creative problem solving. Think of an obstacle as an opportunity to invent a creative solution. Then, create a solution and put it into action.